Let’s take a few minutes away from trivia like health care reform, cap-and-trade, and economic woes to think about something really important. This plant only blooms every four to six years within its 40-year life expectancy. The flower is described as the world’s largest; reaching 5ft high and 4ft wide. 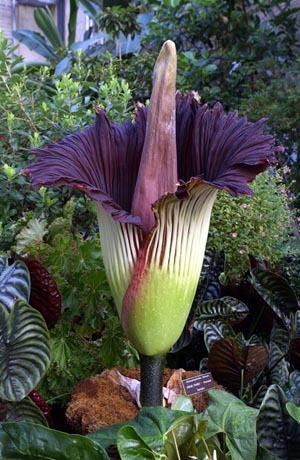 For eight hours of the three-day bloom, the flower emits a smell that is described as rotting flesh, attracting a carrion-eating beetle, for pollination. The plant is also known as an aphrodisiac. You’d have to need an aphrodisiac pretty badly to use this thing. Yuck. This monster is five feet tall, four feet wide, and smells like dead bodies. I certainly wouldn’t want to stumble into it on a dark night…. i think the flower is pretty and cool. it may smell bad but i think its still awesome. in the picture i dont think it looks ugly. Raven– I agree with you i have seen this flower only once and it is awesome to behold. Yes, Tom it does smell like dead bodies trapped in a car for days but it’s beauty almost makes it worth it. Looks awesome,and the smell should keep plant eaters away.I wonder if it is poisonous,do you know,Terri?Is it purple or just looks that color in this picture?I think it is now my favorite flower,could any man afford a dozen?If he can,I wouldn’t kick him out of bed,for eating crackers. I’m doing a biology report on this plant and I’ve seen pictures of the big purple looking one like above, but I’ve also seen picture of a round red colored plant… Are they the same thing? Jessica, I’m not an expert on these things, so I can’t help you very much. It looks like the red plant you mentioned might be rafflesia, which is related to the plant in the picture on this page. You can read about rafflesia here. The corpse flower is beautiful and extremely rare. To see something so amazing even once in your life is a great privilege no matter what it may smell like. It may just be a flower whose bloom only opens for a few short days and its smell may be horrific but its beauty and magnificence overpowers any flaws it may have compared to perfection. So I believe that the corpse flower is much too close to perfection to be considered the “World’s Ugliest Flower”. this is not the words biggest flower fyi!!!!!!!! !